AF International has a heritage stretching back over 40 years and has long been regarded as a leading provider of specialist PC, workstation, and office equipment cleaning products. AF’s strong foundation will be further expanded as they bring their expertise to the PPE (Personal Protective Equipment) industry. The Specialist Technical Cleaning Range will be showcased at Paperworld Frankfurt (Hall 3.0, Stand E55 - January 28th – 31st 2017). This striking new product selection will be defined by the gunmetal design packaging and clever communicative icons to target the personal protection equipment market. Two key players in this range will be the Safety Glasses Cleaner (SGC) and Hearing Defender Cleaning Wipes (EPC). The new Safety Glasses Cleaning wipes are available in a box of 50 individual impregnated wipes or a handy tub of 60 wipes; they are specifically designed to remove grease and dust from all grades of safety glasses. 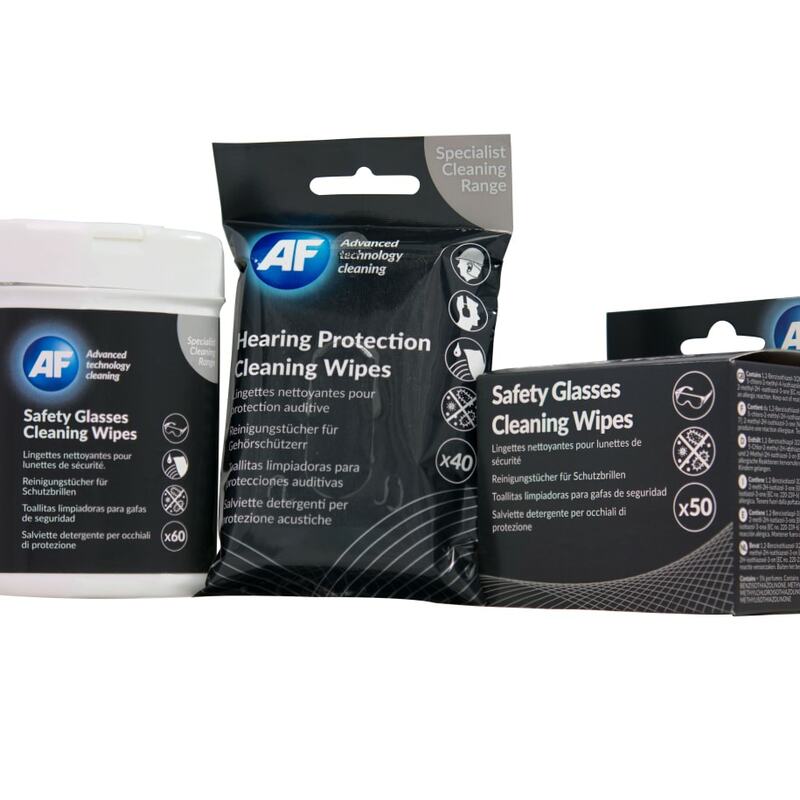 AF’s Hearing Defender Cleaning Wipes have been developed to clean and maintain ear defender safety equipment. Supplied in a convenient flatpack of 40 individual impregnated wipes for the workplace. Extensive research and development has prompted some cutting edge product innovation supported by a smooth supply chain. Today, AF has a strong global position with security of supply through a dedicated distributor network. Paul Hardy, European Brand Director commented, “In depth research has shown the importance of protecting workplace safety equipment and we have the must-have cleaning maintenance products to meet this need. Employee safety is priceless for any company. The global PPE market was valued at USD 38.38 billion in 2015 and is forecasted to rise”. To find out about office equipment cleaning and the right products to use go to www.af-net.com. News updates, competitions and giveaways can be found on our Facebook page, AF International, at https://www.facebook.com/AFInternational and on twitter @AFInternational.